It's certainly been awhile between posts. Not a whole lot to tell really. We've been enjoying Andrew's holidays - relaxing, watching DVDs, scrapping (me not Andrew) playing with Joel, surfing the net. On my wanderings around the world wide web, I discovered Picasa. It is totally the coolest. For those not in the know, Picasa is a photo organisational and editing tool. I made the collage below with the click of a button. Very cool. And so much easier than trying to do it all in Photoshop. And the other bonus is it's hooked up with Blogger so I posted the pic straight from Picasa. So cool. Mum and Dad, you should totally download this. 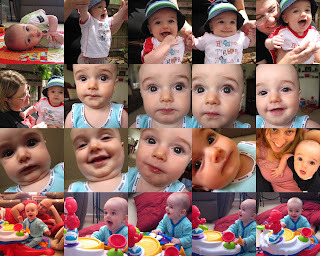 So to show off my Picasa find, I've made a little collage below of a few recent shots of the lovely Joel. Still totally in love with him and ever the smitten kitten. Andrew is back at school next week so that should bring a little more normalcy and routine back into our lives. Joel is totally going to miss him when he goes back to work. When I am feeding, he is constantly stopping and looking around for Andrew. If he sees him, he cracks the biggest grin. So cute. I went and saw my first movie post Joel on Monday. Took my niece. We were going to see Enchanted which I've been hanging to see. But it was sold out!!!!! NOOOOOOOOOOOOOOO! So we saw Alvin and the Chipmunks instead, which was very cute. Andrew's told me to go to the movies by myself tomorrow (before he goes back to work) so I might go and check out 27 dresses. Anyway, I better go do some housework before the little dude awakes. What a year 2007 was for my family. This time last year I was 13 weeks pregnant and thinking that having a baby would be the only big thing to happen in 2007. How wrong I was. Joel came along on July 2nd and life has not been the same since and I wouldn't change a minute of it. I love him to bits and am truly enjoying all that motherhood brings. 3 weeks after Joel was born, my nanna passed away. I miss her so much and know that she would have enjoyed watching Joel grow up. And then my parents moved to Moldova. I sometimes still can't believe it's a country!! LOL. But they are loving it over there. I miss them heaps too though. We had a great New Years Eve. I made cupcakes and a whole heap of our friends got together at Scott & Kathryn's house (Joel's godparents) We ate food, chatted, played Taboo, sweated and melted!! It was 41 degrees here in Melbourne on NYE and New Years Day. So hot. Bring on winter please. Joel is doing really well in the heat - he's not a huge fan of the heat but he's coping brilliantly. He has become so very noisy and talkative over the last couple of weeks. Lots of squealing and raspeberries and little laughs. He cracks me up all the time. I'll have to capture some on video and share it with you all. It really is cute. Andrew is still on school holidays so we are spending lots of time together. It's great to have him around to help out with Joel. We made a trip into IKEA on Friday. I seriously love that place. We bought a storage unit/bookcase for the lounge and some baskets for it, to store some of Joel's toys in. Had my swedish meatball fix for lunch - YUM!! Our friends Marina and Peter and their little boy Samuel came along as well. Joel and Sam loving playing with each other and I think they both enjoyed their first IKEA experience. Been doing some organizing/purging/sorting/tidying around the house. Feeling the need to declutter and simplify. Done Joel's wardrobe and drawers, my scrapbooking cupboard. Want to get the linen closet (scary!!) and the pantry done before Andrew goes back. Nothing like a good clean out and clean up to start the new year. Joel has his 6 month check-up tomorrow. Can't wait to see how he's progressing. He has gotten really long and he's certainly getting heavier. We've started giving Joel some tastes of foods. He's a bit freaked out by it all - pulls these little faces as if he's eaten a lemon or something sour. So funny. He's tried rice cereal, apples and pear so far. He looks so little sitting in the high chair. So that's about it from around here. Still very much in relaxation/holiday mode and loving it. Might do some more baking and scrapbooking over the next couple of weeks. Will share any LOs as I go.